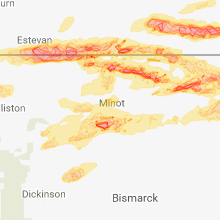 The Voltaire, ND area has had 7 reports of on-the-ground hail by trained spotters, and has been under severe weather warnings 13 times during the past 12 months. 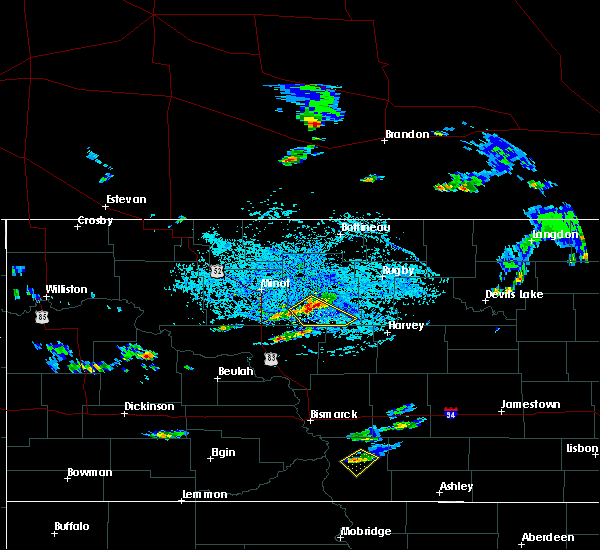 Doppler radar has detected hail at or near Voltaire, ND on 24 occasions, including 1 occasion during the past year. 6/14/2018 10:38 PM CDT At 1037 pm cdt, a severe thunderstorm was located 6 miles northeast of drake, or 23 miles northwest of harvey, moving east at 45 mph. 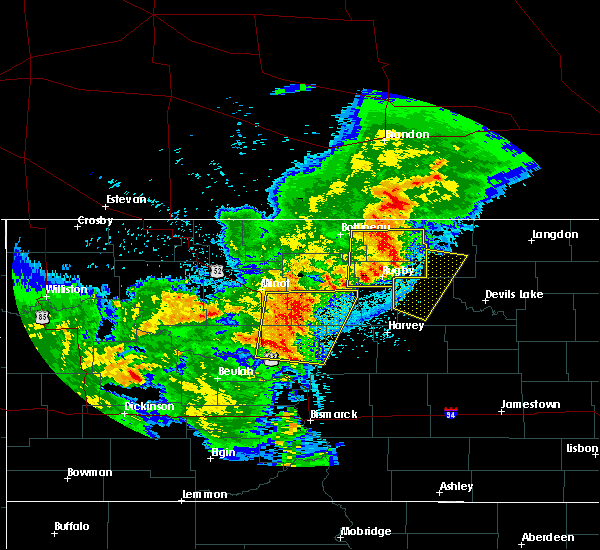 another severe thunderstorm was located just south of rice lake, moving east at 45 mph (radar indicated). Hazards include 60 mph wind gusts and nickel size hail. Expect damage to roofs, siding, and trees. this severe thunderstorm will remain over mainly rural areas of southeastern ward and mchenry counties, including the following locations, balfour, logan, bergen, norwich, voltaire, berwick, george lake, kief and simcoe. 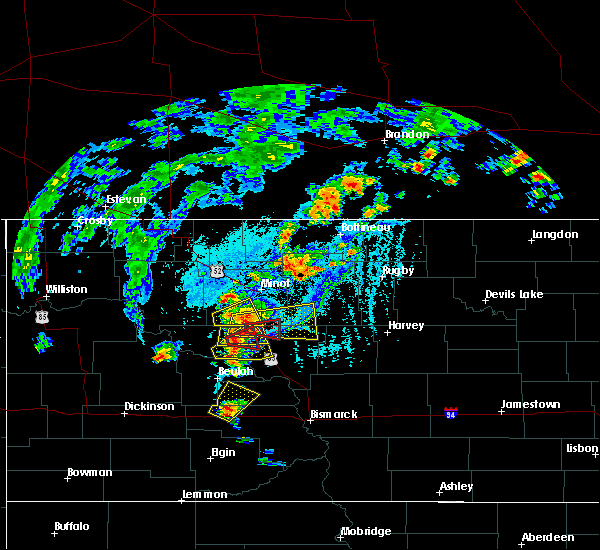 A tornado watch remains in effect until 1100 pm cdt for north central north dakota. 6/14/2018 10:22 PM CDT At 1021 pm cdt, a severe thunderstorm was located near karlsruhe, or 30 miles southeast of minot, moving east at 45 mph. another severe thunderstorm was moving into far southwest ward county, south of makoti (radar indicated). Hazards include 60 mph wind gusts and quarter size hail. Hail damage to vehicles is expected. expect wind damage to roofs, siding, and trees. 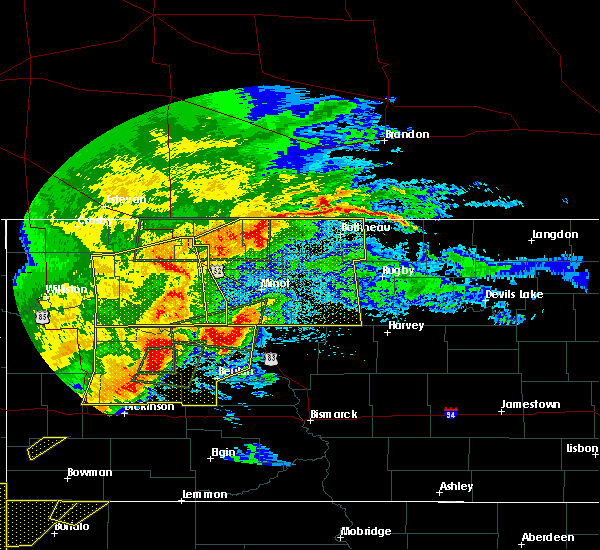 this severe storm will be near, karlsruhe around 1025 pm cdt. other locations impacted by this severe thunderstorm include balfour, logan, bergen, norwich, voltaire, berwick, george lake, kief and simcoe. 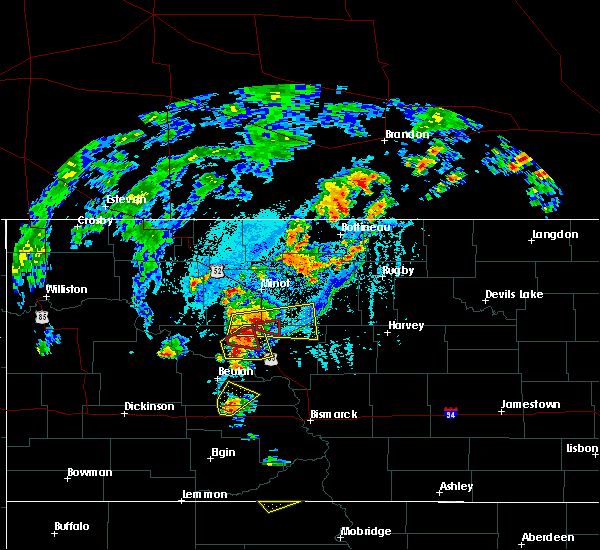 A tornado watch remains in effect until 1100 pm cdt for north central and northwestern north dakota. 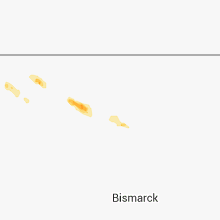 6/14/2018 9:59 PM CDT The national weather service in bismarck has issued a * severe thunderstorm warning for. 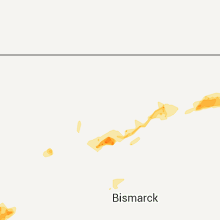 ward county in north central north dakota. 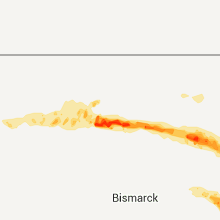 mchenry county in north central north dakota. until 1100 pm cdt. 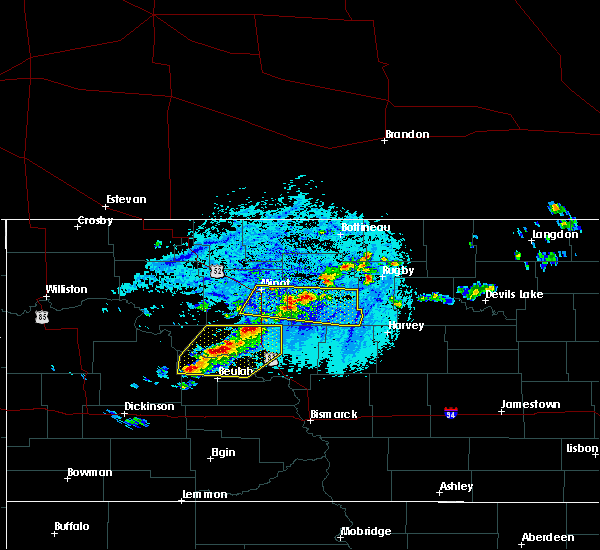 At 958 pm cdt, severe thunderstorms were located near sawyer, or. 5/27/2018 4:26 AM CDT The severe thunderstorm warning for eastern mclean, southwestern mchenry and east central mercer counties will expire at 430 am cdt, the storms which prompted the warning have weakened below severe limits, and no longer pose an immediate threat to life or property. therefore, the warning will be allowed to expire. 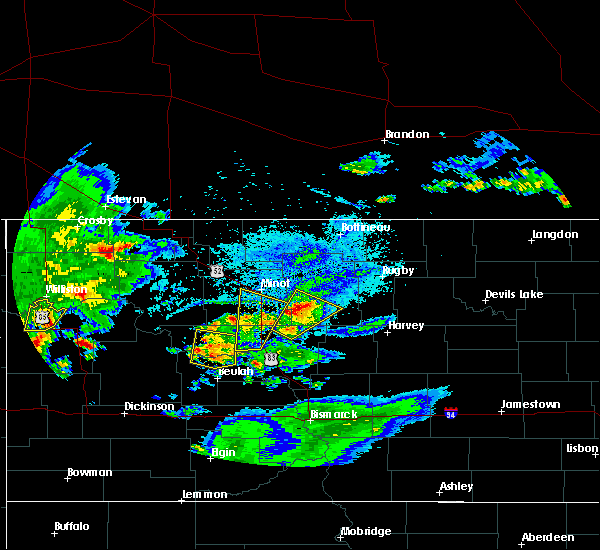 however small hail and gusty winds are still possible with these thunderstorms. 5/27/2018 4:15 AM CDT At 414 am cdt, severe thunderstorms were located along a line extending from 4 miles west of karlsruhe to 9 miles south of butte to 5 miles west of washburn, moving southeast at 35 mph (radar indicated). Hazards include 60 mph wind gusts. Expect damage to roofs, siding, and trees. These severe thunderstorms will remain over mainly rural areas of eastern mclean, southwestern mchenry and east central mercer counties, including the following locations, voltaire, ruso, bergen, strawberry lake and falkirk. 7/24/2017 11:41 PM CDT At 1140 pm cdt, a severe thunderstorm was located near velva, or 22 miles southeast of minot, moving northeast at 45 mph (radar indicated). Hazards include 60 mph wind gusts and quarter size hail. Hail damage to vehicles is expected. expect wind damage to roofs, siding, and trees. 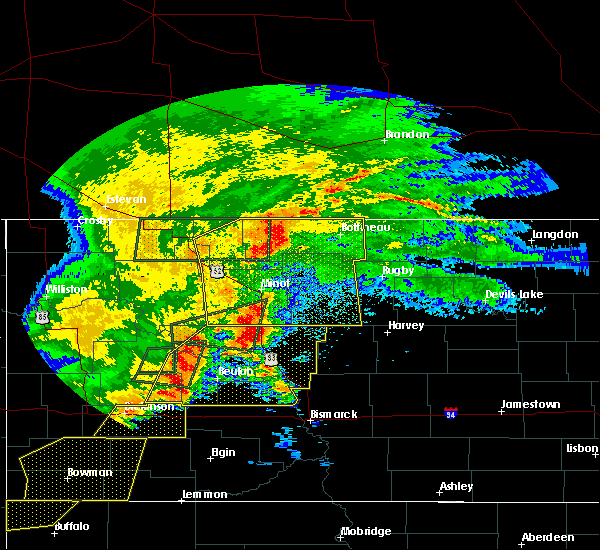 this severe thunderstorm will be near, karlsruhe around 1200 am cdt. towner around 1225 am cdt. Other locations impacted by this severe thunderstorm include voltaire, george lake, bergen and simcoe. 7/24/2017 10:52 PM CDT At 1052 pm cdt, severe thunderstorms were located along a line extending from 4 miles southwest of deering to 8 miles north of max, moving northeast at 45 mph (trained weather spotters). Hazards include quarter size hail. Damage to vehicles is expected. 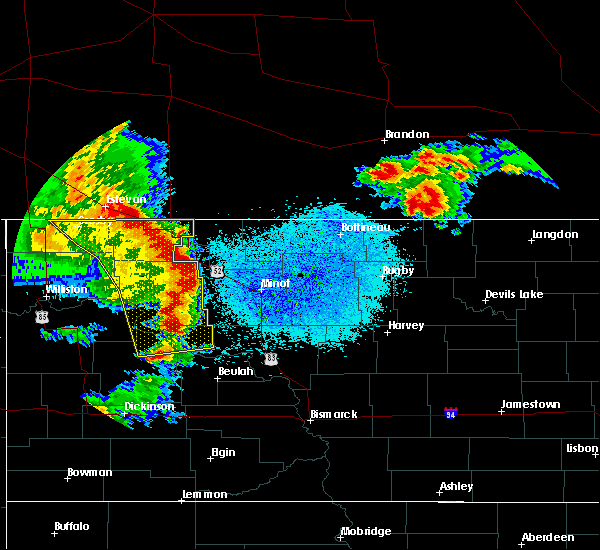 these severe storms will be near, sawyer around 1110 pm cdt. 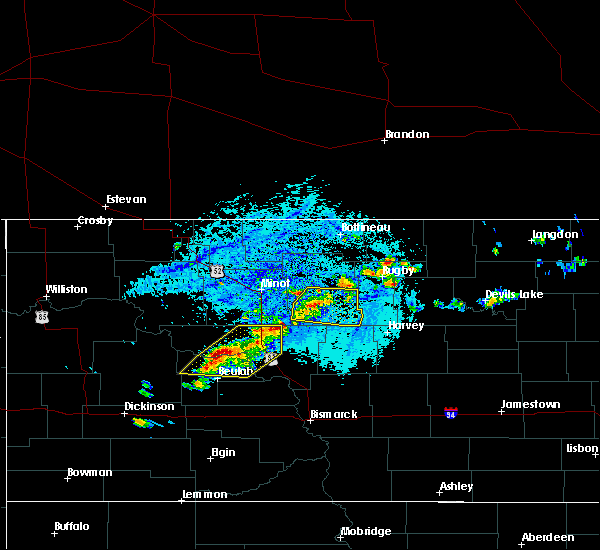 velva around 1120 pm cdt. 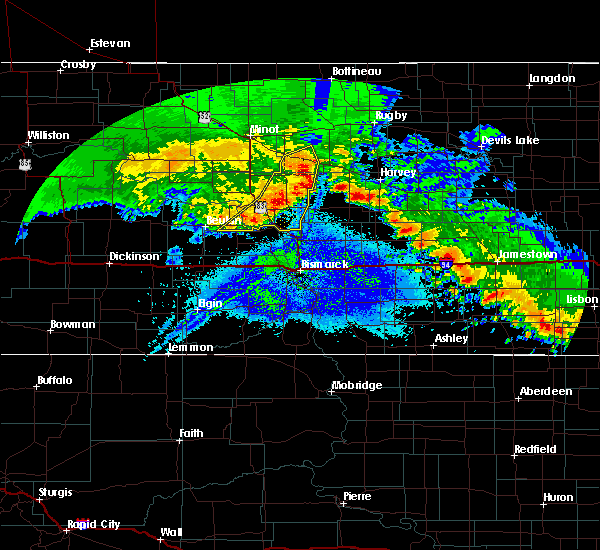 granville around 1135 pm cdt. Other locations impacted by these severe thunderstorms include voltaire, logan, simcoe, norwich and bantry. 7/24/2017 10:39 PM CDT At 1039 pm cdt, severe thunderstorms were located along a line extending from near minot to near douglas, moving northeast at 45 mph (radar indicated). Hazards include 60 mph wind gusts and quarter size hail. Hail damage to vehicles is expected. expect wind damage to roofs, siding, and trees. 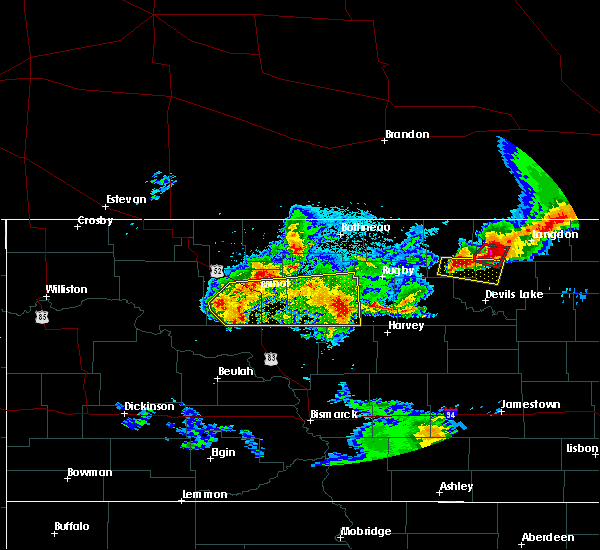 severe thunderstorms will be near, minot and surrey around 1045 pm cdt. sawyer around 1110 pm cdt. 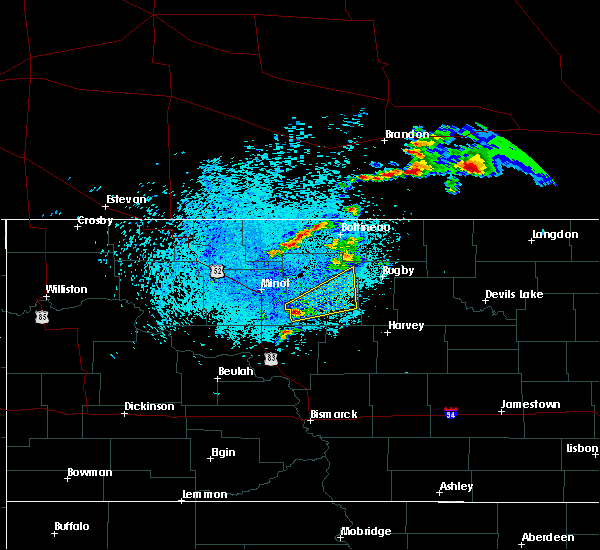 velva around 1120 pm cdt. 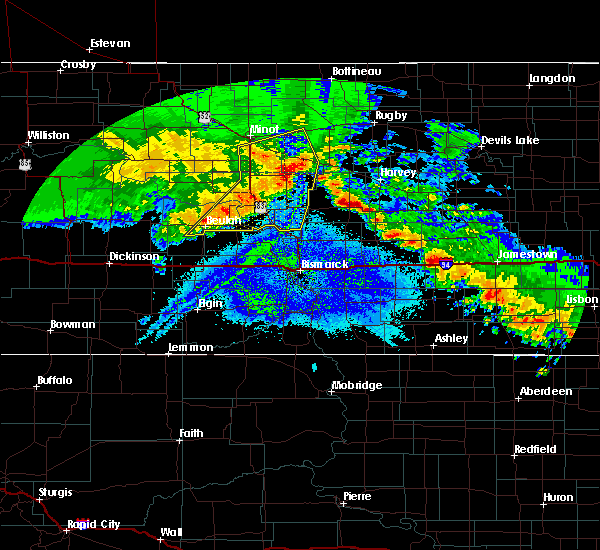 granville around 1135 pm cdt. Other locations impacted by these severe thunderstorms include voltaire, logan, simcoe, norwich and bantry. 7/14/2017 5:11 PM CDT Quarter sized hail reported 0.2 miles W of Voltaire, ND, report relayed to nws from media. 7/14/2017 5:11 PM CDT Quarter sized hail reported 11.1 miles N of Voltaire, ND, correction to location from voltaire to 11 south voltaire (5 miles ene ruso). report relayed to nws through media. 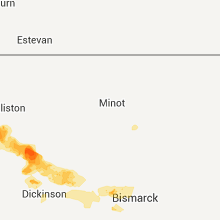 7/14/2017 4:49 PM CDT At 448 pm cdt, a severe thunderstorm was located near karlsruhe, or 29 miles southeast of minot, moving east at 40 mph (radar indicated). Hazards include 60 mph wind gusts and nickel size hail. Expect damage to roofs, siding, and trees. 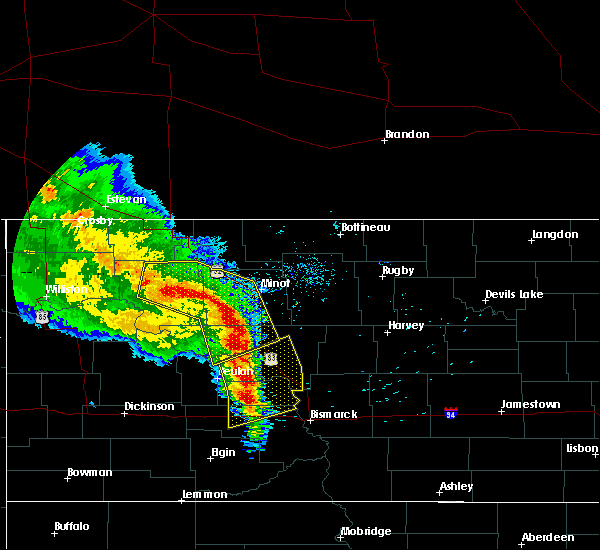 this severe storm will be near, drake around 515 pm cdt. Other locations impacted by this severe thunderstorm include balfour, voltaire, george lake, bergen, simcoe and kief. 7/14/2017 4:35 PM CDT At 435 pm cdt, a severe thunderstorm was located over velva, or 20 miles southeast of minot, moving east at 40 mph (radar indicated). Hazards include 60 mph wind gusts and quarter size hail. Hail damage to vehicles is expected. expect wind damage to roofs, siding, and trees. this severe storm will be near, karlsruhe around 455 pm cdt. 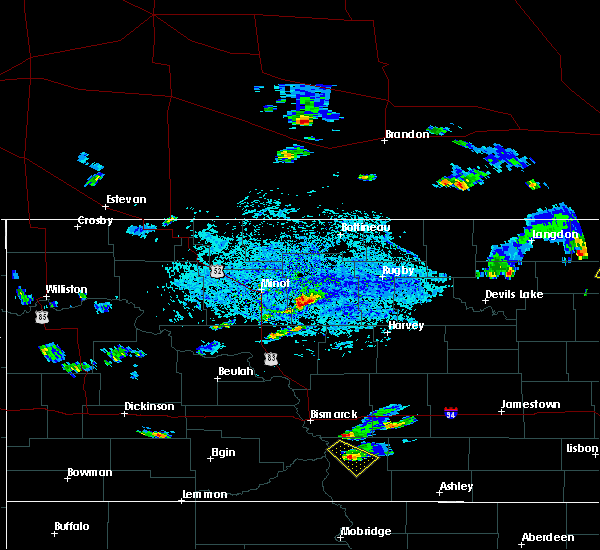 drake around 515 pm cdt. Other locations impacted by this severe thunderstorm include balfour, bergen, norwich, voltaire, george lake, simcoe and kief. 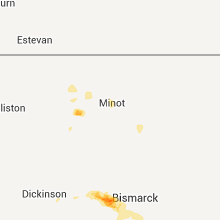 7/14/2017 4:17 PM CDT At 416 pm cdt, a severe thunderstorm was located 6 miles west of sawyer, or 8 miles southeast of minot, moving east at 40 mph (radar indicated). Hazards include 60 mph wind gusts and quarter size hail. Hail damage to vehicles is expected. expect wind damage to roofs, siding, and trees. 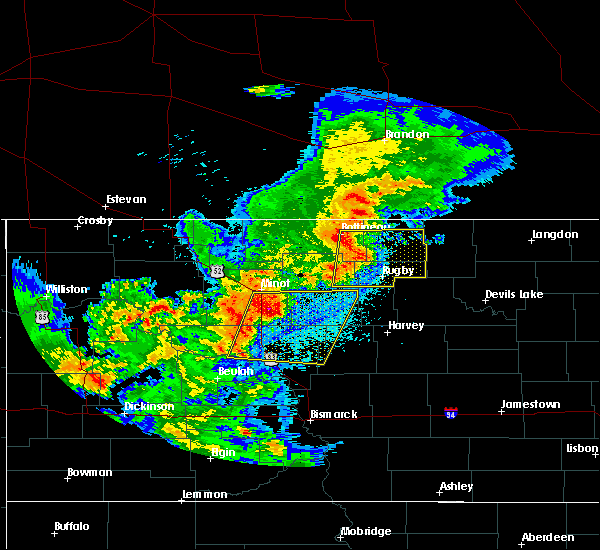 this severe thunderstorm will be near, sawyer around 425 pm cdt. velva around 435 pm cdt. karlsruhe around 455 pm cdt. 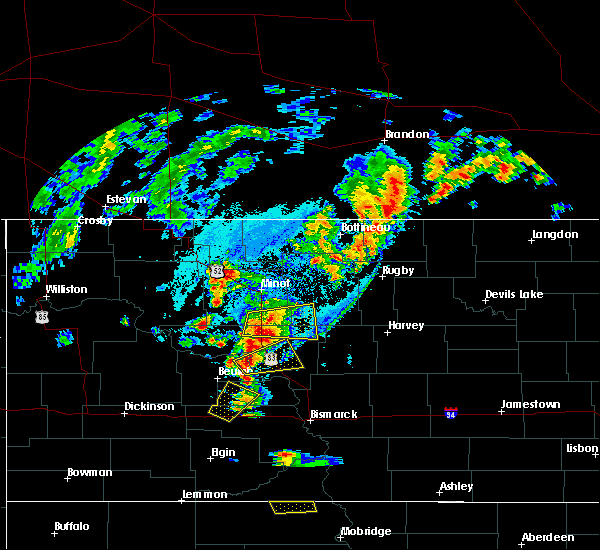 drake around 515 pm cdt. Other locations impacted by this severe thunderstorm include balfour, logan, bergen, norwich, voltaire, george lake, simcoe and kief. 7/20/2016 7:03 PM CDT At 703 pm cdt, a severe thunderstorm was located 7 miles south of denbigh, or 27 miles southwest of rugby, moving east at 35 mph (radar indicated). Hazards include 60 mph wind gusts and quarter size hail. Hail damage to vehicles is expected. expect wind damage to roofs, siding, and trees. this severe thunderstorm will remain over mainly rural areas of western pierce and southern mchenry counties, including the following locations: orrin, berwick, george lake, bergen, balfour and voltaire. 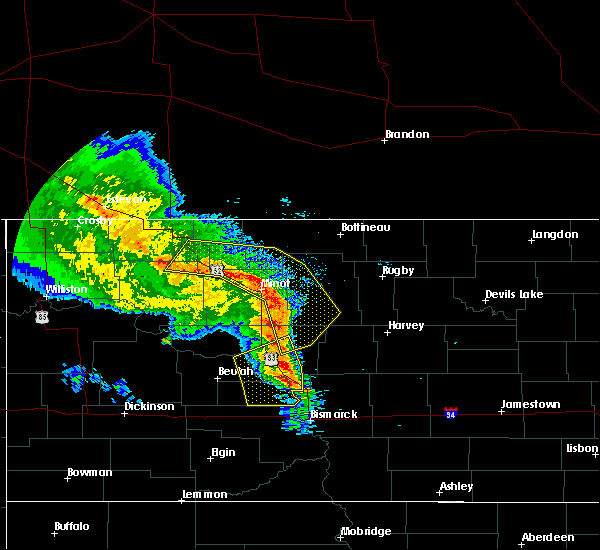 A tornado watch remains in effect until 1100 pm cdt for north central north dakota. 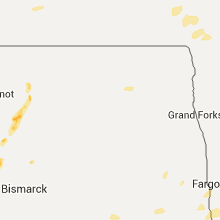 7/20/2016 6:42 PM CDT At 642 pm cdt, a severe thunderstorm was located over granville, or 22 miles east of minot, moving east at 35 mph (radar indicated). 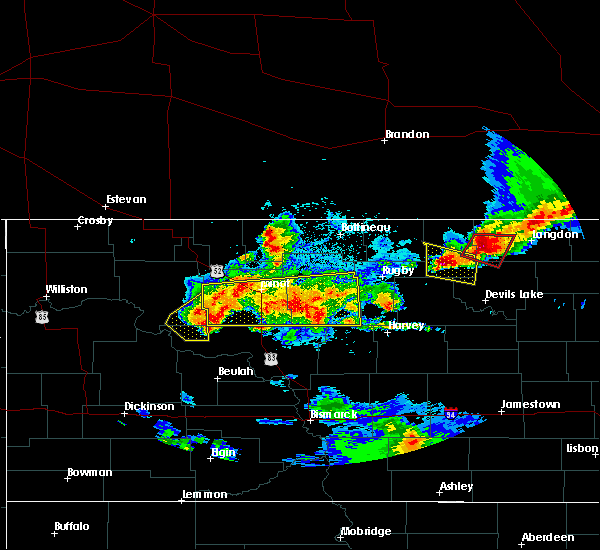 Hazards include 60 mph wind gusts and half dollar size hail. Hail damage to vehicles is expected. expect wind damage to roofs, siding, and trees. 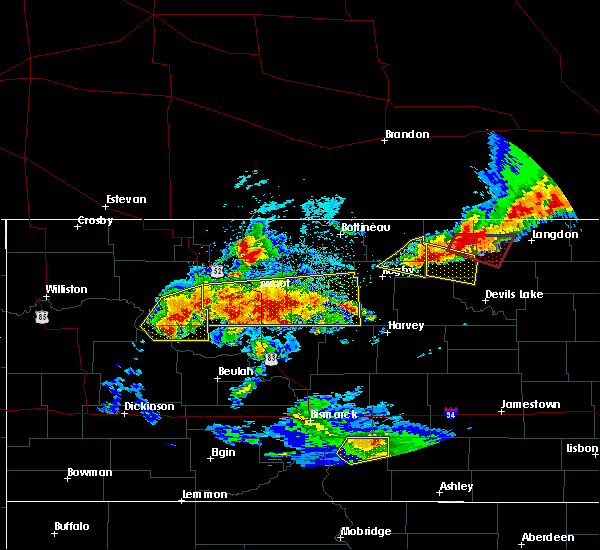 this severe thunderstorm will be near, denbigh around 655 pm cdt. other locations impacted by this severe thunderstorm include orrin, berwick, george lake, bergen, simcoe, balfour and voltaire. 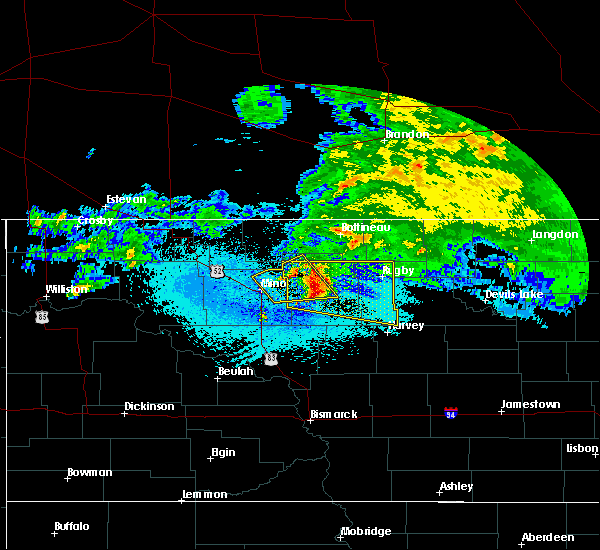 A tornado watch remains in effect until 1100 pm cdt for north central north dakota. 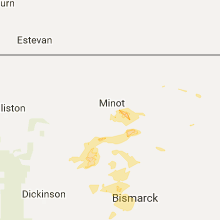 6/19/2016 2:47 AM CDT At 247 am cdt, a severe thunderstorm was located near granville, or 24 miles east of minot, moving east at 55 mph (radar indicated). Hazards include golf ball size hail and 60 mph wind gusts. People and animals outdoors will be injured. expect hail damage to roofs, siding, windows, and vehicles. expect wind damage to roofs, siding, and trees. 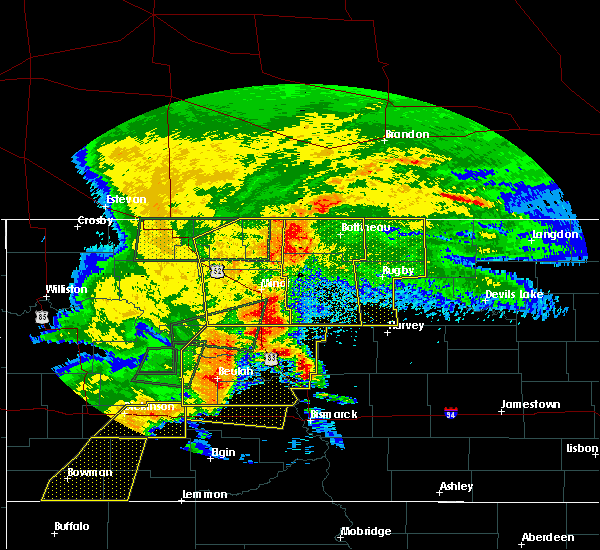 this severe thunderstorm will be near, denbigh around 255 am cdt. towner around 305 am cdt. 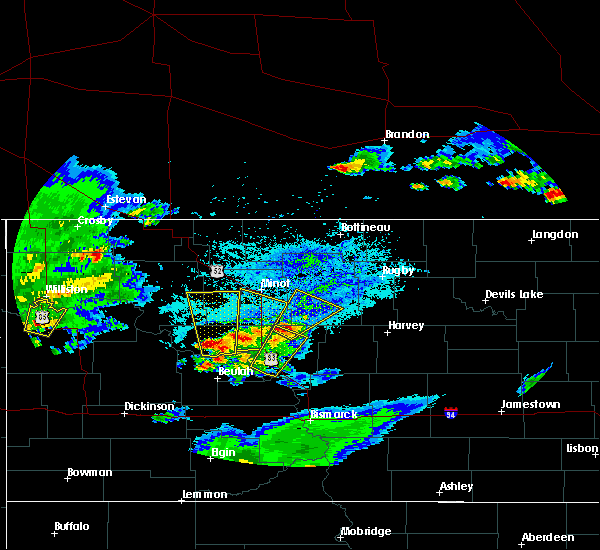 balta around 325 am cdt. rugby around 330 am cdt. Other locations impacted by this severe thunderstorm include orrin, bantry, berwick, norwich, george lake, simcoe, silva, bergen and voltaire. 6/10/2016 12:15 AM CDT At 1214 am cdt, severe thunderstorms were located along a line extending from 6 miles northwest of karlsruhe to turtle lake, moving east at 45 mph (radar indicated). Hazards include 60 mph wind gusts and quarter size hail. Hail damage to vehicles is expected. expect wind damage to roofs, siding, and trees. Locations impacted include, velva, turtle lake, sawyer, max, drake, mercer, karlsruhe, coleharbor, butte, benedict, voltaire, logan, balfour, kief, bergen, ruso, george lake, krueger lake, simcoe and strawberry lake. 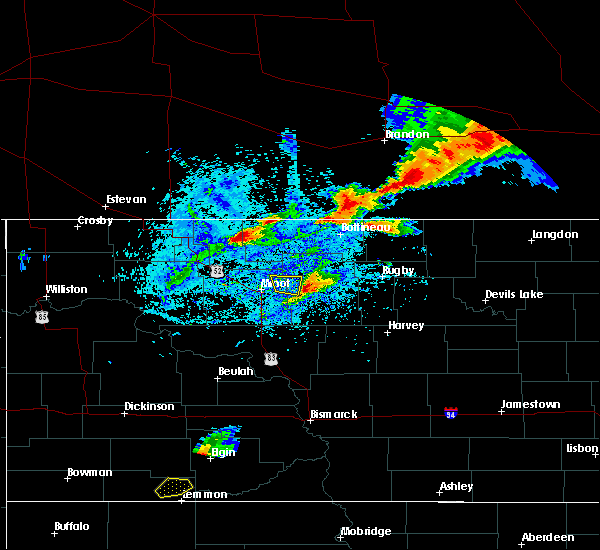 6/9/2016 11:48 PM CDT At 1147 pm cdt, severe thunderstorms were located along a line extending from 5 miles northeast of sawyer to lake sakakawea state park, moving east at 40 mph (radar indicated). Hazards include 60 mph wind gusts and quarter size hail. Hail damage to vehicles is expected. Expect wind damage to roofs, siding, and trees. 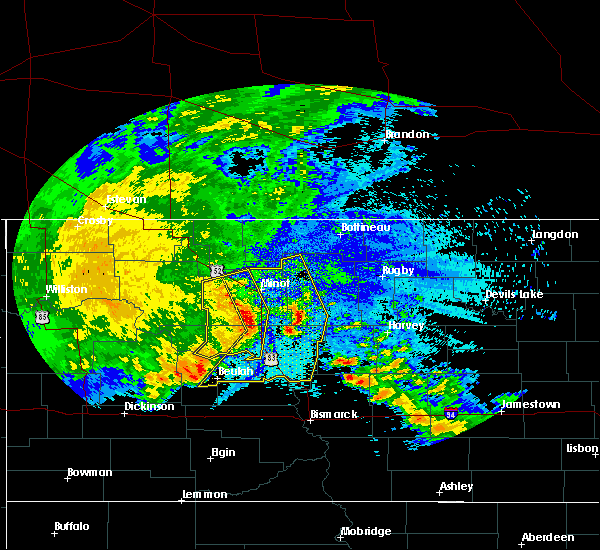 9/6/2015 2:43 AM CDT The severe thunderstorm warning for northeastern mclean, northeastern mountrail, southern renville, western mchenry, central ward and southwestern bottineau counties will expire at 245 am cdt, the storms which prompted the warning have weakened below severe limits, and no longer pose an immediate threat to life or property. therefore the warning will be allowed to expire. however gusty winds and heavy rain are still possible with these thunderstorms. 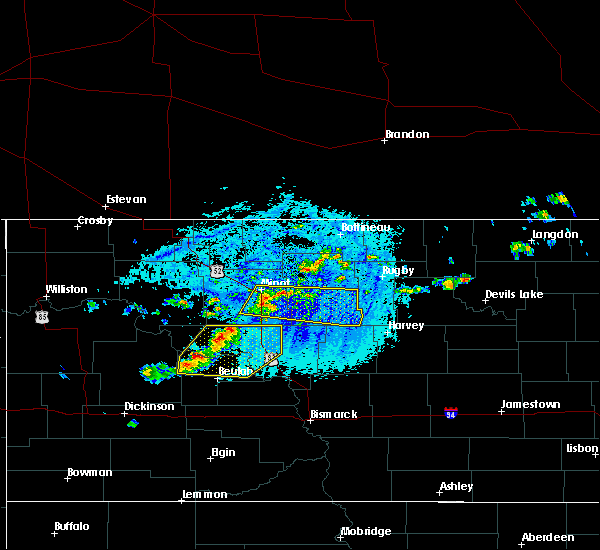 a severe thunderstorm watch remains in effect until 400 am cdt for western north dakota. 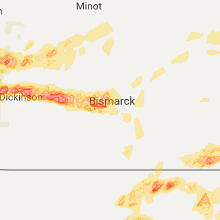 9/6/2015 2:27 AM CDT At 227 am cdt, severe thunderstorms were located along a line extending from 7 miles west of donnybrook to 8 miles north of foxholm to 5 miles northwest of surrey to near benedict, moving northeast at 50 mph (radar indicated). Hazards include 70 mph wind gusts. Expect considerable tree damage. damage is likely to mobile homes, roofs and outbuildings. 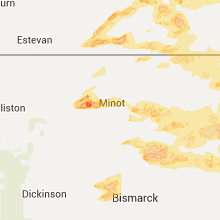 Locations impacted include, minot, minot air force base, kenmare, velva, burlington, surrey, glenburn, sawyer, lansford, granville, carpio, foxholm, greene, deering, karlsruhe, butte, benedict, donnybrook, norwich and coulee. 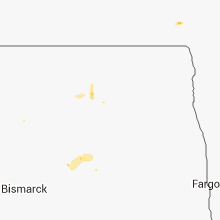 9/6/2015 1:57 AM CDT At 155 am cdt, severe thunderstorms were located along a line extending from near stanley to 9 miles southeast of blaisdell to 5 miles northwest of rice lake to fort stevenson state park, moving northeast at 50 mph (public). Hazards include 70 mph wind gusts. Expect considerable tree damage. Damage is likely to mobile homes, roofs and outbuildings. 7/23/2015 6:19 PM CDT At 619 pm cdt, a severe thunderstorm was located over benedict, or 18 miles northeast of garrison, moving east at 25 mph (radar indicated). Hazards include 60 mph wind gusts and quarter size hail. Hail damage to vehicles is expected. expect wind damage to roofs, siding and trees. This severe thunderstorm will remain over mainly rural areas of southeastern ward, southwestern mchenry and northeastern mclean counties, including the following locations, voltaire, ruso, bergen and strawberry lake. 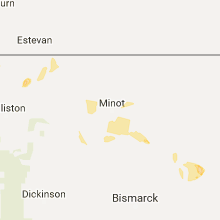 7/23/2015 5:49 PM CDT At 548 pm cdt, a severe thunderstorm was located over max, or 15 miles north of garrison, moving east at 30 mph. 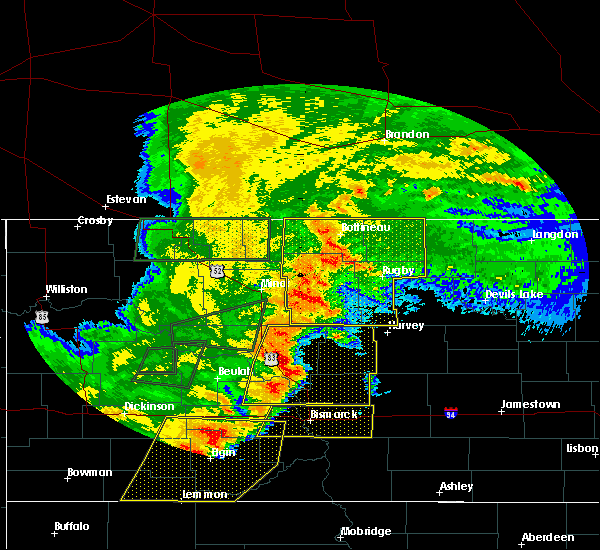 70 mph winds was reported east of douglas with this storm. highway 83 will be impacted (public). Hazards include 70 mph wind gusts and ping pong ball size hail. People and animals outdoors will be injured. expect hail damage to roofs, siding, windows and vehicles. expect considerable tree damage. wind damage is also likely to mobile homes, roofs and outbuildings. 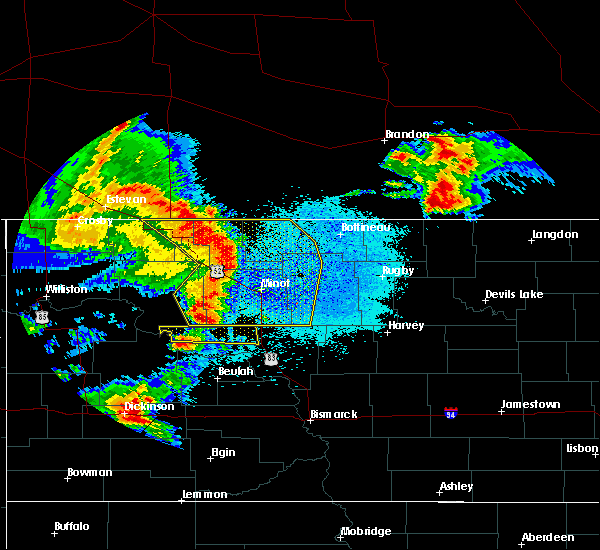 this severe storm will be near, benedict around 610 pm cdt. Other locations impacted by this severe thunderstorm include voltaire, ruso, bergen and strawberry lake. 7/23/2015 5:41 PM CDT At 540 pm cdt, a severe thunderstorm was located near max, or 14 miles north of garrison, along the border of ward and mclean counties, moving east at 30 mph (radar indicated). Hazards include 60 mph wind gusts and quarter size hail. Hail damage to vehicles is expected. expect wind damage to roofs, siding and trees. 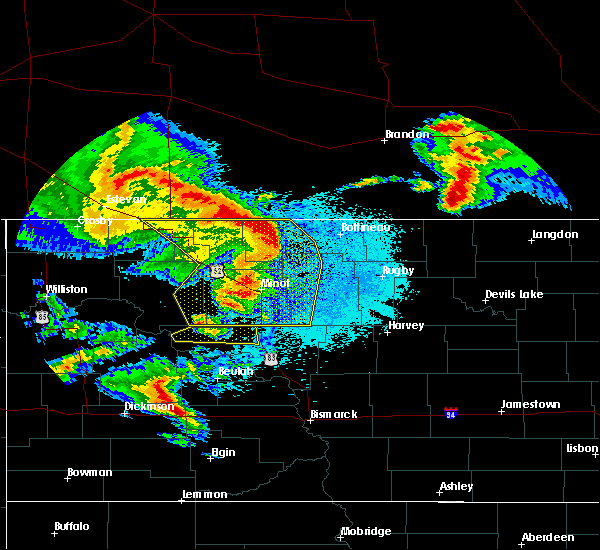 this severe thunderstorm will be near, max around 550 pm cdt. 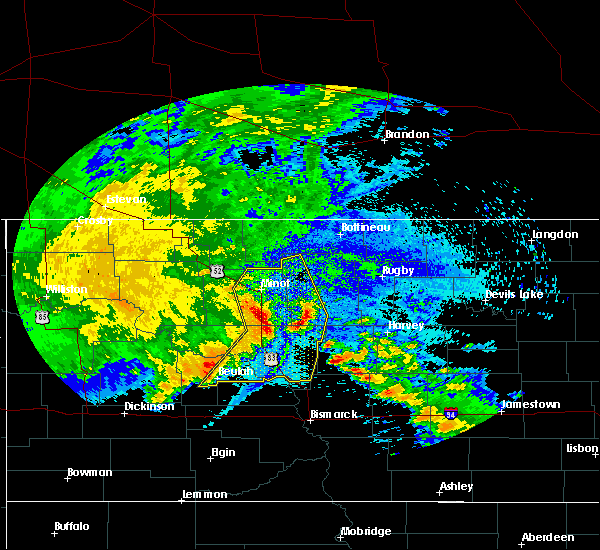 benedict around 610 pm cdt. Other locations impacted by this severe thunderstorm include voltaire, ruso, bergen and strawberry lake. 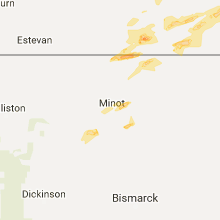 7/15/2015 8:16 PM CDT At 814 pm cdt, a severe thunderstorm was located near velva, or 22 miles southeast of minot, moving northeast at 30 mph (radar indicated. 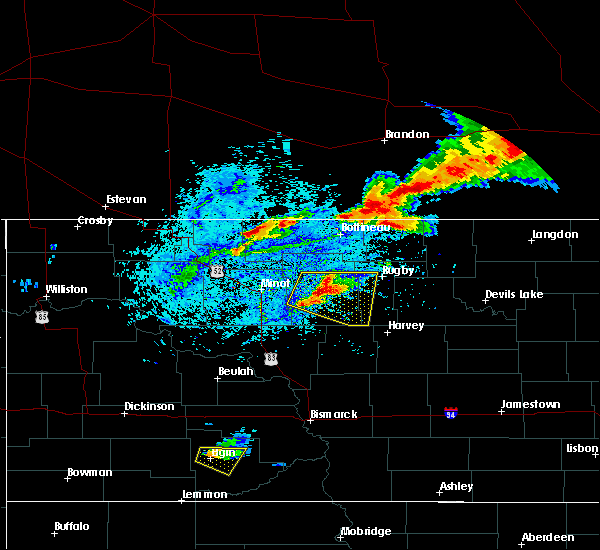 at 800 pm cdt 1 inch sized hail was reported 6 miles south of velva). Hazards include 60 mph wind gusts and quarter size hail. Hail damage to vehicles is expected. expect wind damage to roofs, siding and trees. This severe thunderstorm will remain over mainly rural areas of southeastern ward, southwestern mchenry and northeastern mclean counties, including the following locations, voltaire, ruso, bergen, balfour, strawberry lake and simcoe. 7/15/2015 7:42 PM CDT At 740 pm cdt, a severe thunderstorm was located near benedict, or 22 miles northeast of garrison, moving northeast at 25 mph (radar indicated). Hazards include 60 mph wind gusts and quarter size hail. Hail damage to vehicles is expected. expect wind damage to roofs, siding and trees. this severe thunderstorm will be near, ruso around 745 pm cdt. karlsruhe around 845 pm cdt. Other locations impacted by this severe thunderstorm include voltaire, bergen, balfour, strawberry lake and simcoe. 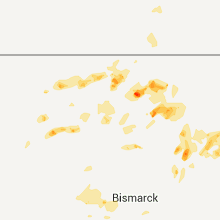 7/14/2015 5:42 PM CDT At 540 pm cdt, a severe thunderstorm was located 8 miles southwest of karlsruhe, or 29 miles southeast of minot, moving southeast at 25 mph (radar indicated). Hazards include golf ball size hail and 70 mph wind gusts. People and animals outdoors will be injured. expect hail damage to roofs, siding, windows and vehicles. expect considerable tree damage. wind damage is also likely to mobile homes, roofs and outbuildings. This severe thunderstorm will remain over mainly rural areas of southern mchenry county, including the following locations, voltaire, kief, bergen and balfour. 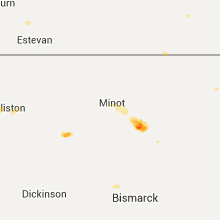 7/14/2015 5:28 PM CDT At 528 pm cdt, a severe thunderstorm was located 5 miles east of velva, or 25 miles southeast of minot, moving southeast at 25 mph (radar indicated). Hazards include 60 mph wind gusts and quarter size hail. Hail damage to vehicles is expected. expect wind damage to roofs, siding and trees. this severe thunderstorm will be near, karlsruhe around 540 pm cdt. 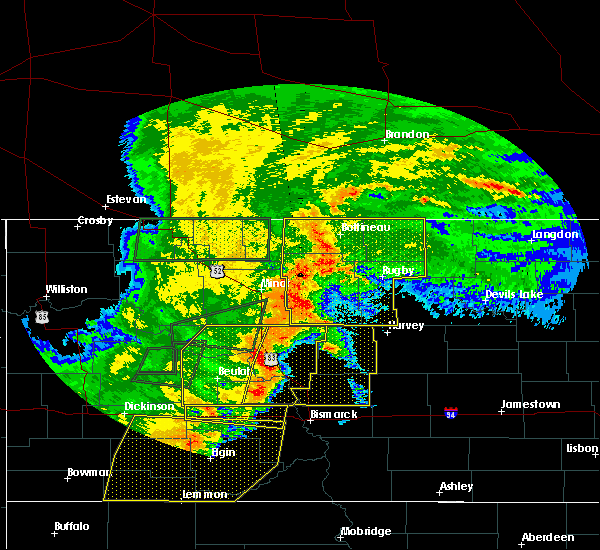 Other locations impacted by this severe thunderstorm include voltaire, kief, bergen and balfour. 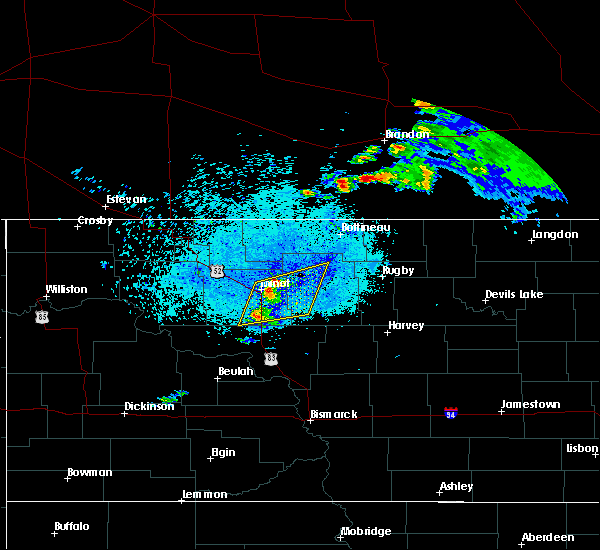 1/1/0001 12:00 AM Golf Ball sized hail reported 0.2 miles W of Voltaire, ND, report relayed by the media.